The Maria Theresien Kaserne is a set of barracks and serves as an army base in the 13th district of Hietzing. The most interesting feature of the Maria Theresien Kaserne - apart from its architecture - is that the buildings were incorporated into the historic array of the palace and parks of Schloss Schönbrunn. The Maria Theresien Kaserne is one of many large, historic barracks in Vienna, but one of the few that were built mostly by the Nazis and that are still in active use. The construction of the Maria Theresien Kasnere was started in 1937, when the Austro-Fascist dictator Engelbert Dollfuss started a "Dollfuss Fürerschule", an elite-training facility - "Führer" means "leader" in German, and despite of being a Fascist despot himself, Dollfuss was not fond of Hitler Germany (for details, see the appropriate section on the inter-war period in my "History of Austria"). The construction of the Fürherschule School progressed very slowly and in 1938, the Anschluss of Austria led to the arrest of Dollfuss and many of his followers. The Nazis continued the construction of the army base with more verve: The barracks were finished within two years, given to the Waffen SS and called "Kaserne Wien-Schönbrunn". 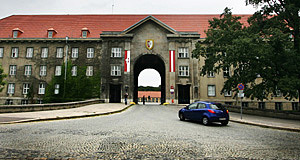 After the end of WWII, the barracks became home to British troops and later (meaning after the re-establishment of the Austrian sovereignty in 1955), the Austrian army finally moved in. The barracks had been re-named into "Fasangartenkaserne" by the British, only in 1967 it was named "Maria Theresien Kaserne". The name is abbreviated as "MTK" and nicknamed in army slang as "Maresi" - phonetically similar and a casual abriviation, but also a common brand of condensed milk in Austria. In 2004, the MTK was the first army base in Austria to open a Muslim prayer room for Muslim soldiers. In the past few years, many army bases in Austria have been closed down and sold. The Maria-Theresien Kaserne is one of the barracks that might be closed down in the near future; in case this should happen, there are plans to make it a "campus" with a combined use as a residential area, a recreational area and a venue for cultural events. At the present moment, the Maria Theresien Kaserne is not open to the public. So why this article? When I worked as an editor for the National Broadcast ORF, I was out filming with camera teams in the city almost every day and often went back to the ORF Zentrum by taxi - which usually went by the Maria Theresien Kaserne. The impressive front side with its gigantic gates made me curious, but the taxi drivers usually said only that it was "some army base". So I looked it up - and this article is the result. Attractions nearby are rather sparse. Schloss Schönbrunn, the Schönbrunn zoo, Schloss Hetzendorf, the cemetery of Hietzing and the ORF Zentrum Hietzing are in walking distance if you are up for a bit of a hike.